This module was developed for grades 6-8, but may be adapted to older grades. Almost everyone has heard about how important biodiversity is. Biodiversity makes ecosystems more productive, and it allows us a greater opportunity to find new organisms that will make important food or medicines for us. Or you may have heard that a place like the Great Smoky Mountains National Park is a "biodiversity hotspot" and should therefore be preserved. But what exactly is biodiversity? And how does one say that biodiversity is greater in one place than another? In this module, students will learn the ecologists' definition of biodiversity, and also two different ways that an area's tally of organisms can differ: species richness and species evenness. 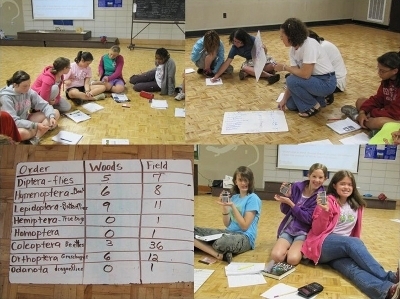 Then, using a hypothetical example of insect data from a forest and a field, they will create a hypothesis of which area will have the greatest biodiversity. Then, they will learn about and use Simpson's Index of Biodiversity, a real-world application of probability, to test out their hypothesis. It is recommended that this module serve as an introduction to the topic, after which the concepts can be applied to real data gathered by students. For example, students could count insects from two different areas in the schoolyard or could inventory tree species found in their yards at home or in a local park. Another version of this activity, adapted for 4H coordinators, is available here: Biodiversity Counts!